People as young as 20 have amyloid buildup, but researchers aren't sure what it means. Brain plaque buildup, long linked to the onset of Alzheimer's disease, has been identified in the brains of men and women as young as 20, researchers say. "One thing this means is that the resource, the machinery, for making the clumps of plaque we see among Alzheimer's patients is already available in young individuals," said study co-author Changiz Geula, a research professor at the Northwestern University Feinberg School of Medicine in Chicago. 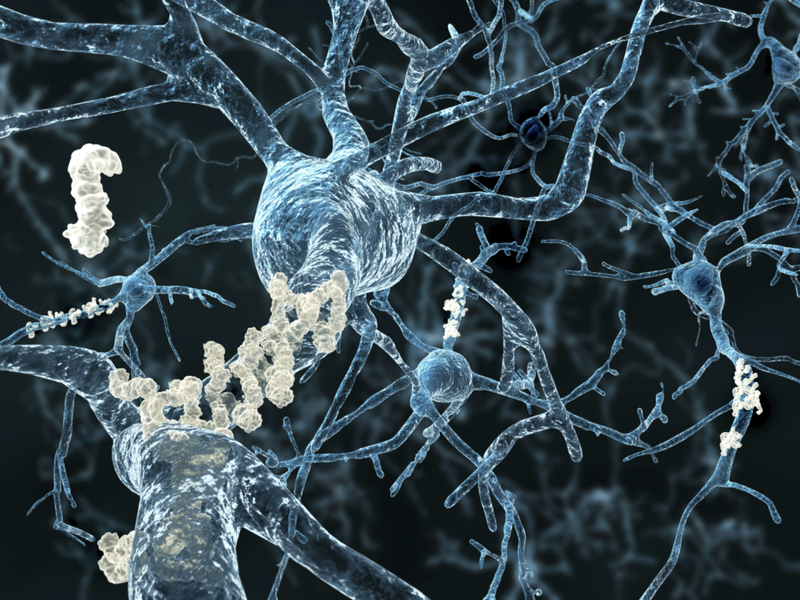 "The implication appears to be that if we want to prevent these clumps from forming when a person becomes old, we may need to intervene much earlier than we have thought, to try and get rid of amyloid very early in life," Geula said. Geula and his colleagues analyzed brain tissue of 48 deceased people ranging in age from 20 to 99. At issue is an abnormal protein, or "amyloid," known to accumulate and surround specialized brain cells called neurons in seniors and those suffering from Alzheimer's. Amyloid buildup is known as plaque. "Amyloid is bad," said Geula. "We don't know the exact mechanism by which it causes damage, or if amyloid buildup is the main trigger for Alzheimer's, so we can't say that it actually causes the disease. But for a long time we have known that it causes toxic damage, and it cannot be good for you when it accumulates." What is new here, and "very surprising, is that we found an accumulation of this amyloid actually inside the nerve cells of individuals as young as 20," Geula added. The findings appear in the March 2 issue of Brain. Alzheimer's disease, a progressive brain disorder, is the most common form of dementia among older people. It's estimated that 5 million Americans have the disease, and that number is growing. The study team analyzed the brains of 13 people aged 20 to 66 with no mental health issues; 14 dementia-free people between 70 and 99; and 21 Alzheimer's patients between 60 and 95. Particular attention was paid to a certain type of neuron -- the "basal forebrain cholinergic neuron" -- that researchers say is especially vulnerable to cell death among Alzheimer's patients. Such neurons are key to memory and attention. Toxic amyloid buildup was seen among such cells across the entire age and health spectrum. Similar signs of buildup were not seen to the same degree among other types of nerve cells in different regions of the brain. Clumps were usually larger in older brains and those with Alzheimer's, the study found. The authors said the growing clumps likely damage and kill the neurons. "But just how much variability there is among the general population remains unclear," Geula admitted. Some of the old people studied had amounts of amyloid that were closer to levels seen among the young, the study found. "What we need to do now is look at a large number of elderly to see whether the ones who have more amyloid face a higher risk for Alzheimer's or poorer [thinking] abilities," Geula said. Striking a cautionary note, Dr. Yvette Sheline, a professor of psychiatry, radiology and neurology at the University of Pennsylvania Perelman School of Medicine, highlighted the "complicated" nature of the findings. Sheline, who wasn't involved in the study, stressed the conclusions were based on just a handful of brain samples. They also were confined solely to plaque growth in a specific part of the brain and neuron type, she noted. "Nonetheless, it is interesting that amyloid accumulation could occur so early in the basal forebrain," Sheline said. But in such a small sample and with no mental assessment in life and no follow-up , she said it's impossible to know if these people would progress to Alzheimer's disease, or if this is part of normal human physiology. Still, Dr. Stephen Salloway, director of the neurology and the memory and aging program at Butler Hospital in Providence, R.I., said the findings may ultimately point to "a key step" in the beginning of Alzheimer's disease. "This process seems to occur earlier in these cells than other brain regions," Salloway noted. Determining why these particular basal neurons are more prone to plaque buildup than other types of neurons "will provide important clues for solving the mystery of Alzheimer's disease," he said.